The annual Shuswap Trail Party & Fundraiser Hit a High Mark! Thank you everyone for making Shuswap Trails such a success story. This year's fundraiser surpassed the last record raising over $45,000 for Shuswap Trail projects throughout the region this year. Remarkable! And there's a whole new twist to supporting Shuswap Trails this year - The Barley Station Brew Pub in Salmon Arm is raising a toast to trails with its brand new Shuswap Trail Ale IPA made exclusively for Shuswap Trails. It was revealed at the February 1st event to resounding acclaim selling out, and now goes on sale at the Barley Station Brew Pub with every glass putting coin toward building and maintaining trails throughout the Shuswap. Now that's worth a toast! Check out the full story here. Check out the new trails built last year by visiting the online trail guide (click on the Trail Icon above right) that includes more new trails in the Shuswap Memorial Cemetery Park, South Canoe Trail System, Rubberhead, and Balmoral. Plus all the new Trails Built in 2017 ready for you to explore: despite the crazy wind-flood-wind-fire-wind-snow season we had this year, trail stewards, volunteers, munipcal/regional/and provincial community partners, funding supporters, clubs, school groups, business teams, Rapattack, the STA trail team, and so many others worked very, very hard in 2017. The result is an incredible 10 new trails added (yes 10! ), totalling over 12,000 metres. 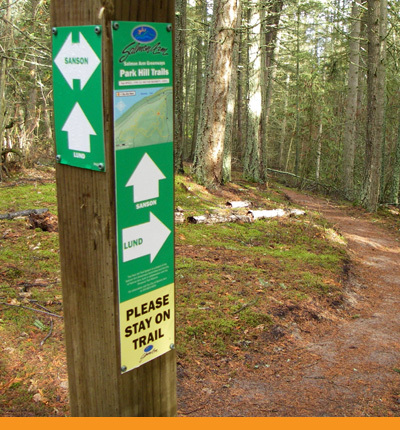 For more on the new stash of Shuswap Trails click through to the trail guide info here. Why not make a lasting contribution to supporting and maintaining Shuswap Trails...contribute to the Shuswap Trail Legacy Fund. Unlike our regular donations, the Legacy Fund builds an endowment trust fund for the future care of trails throughout the Shuswap in partnership with the Shuswap Community Foundation. Click here. Love Your Trails: Shuswap Trail Alliance Memberships 2019 - support 2019 trail projects with a membership. Get the mail-in member form here, or join online here. Shuswap Regional Trails Strategy & Shuswap Trails Roundtable Updates - check out the latest news and updates here. Plus we're continuing to grow the Torres del Paine, Patagonia partnership Our partnership continues, with the successful volunteer exchange in 2017, a brand new volunteer exchange this season, and our Technical Trail Specialist, Sutra Brett journeying down to consult on sustainable trail assessments and planning in 2018, and again in 2019. Check out the very cool presentation on the 2015 visit assembled by our super-awesome Facebook Coordinator, D'Arcy McLeod, using photos, film footage, and the CBC Interview with STA Project Manager, Veda Roberge, and Technical Trails Specialist, Sutra Brett. Click here. The Shuswap Trail Alliance is working to park cars and get people on bicycle and feet. . .and paddles, and skis, and snowshoes, and horses, and. . . The Shuswap Trail Alliance exists as a collaboration of partners working together to create purpose built, sanctioned and sustainable trails throughout the Shuswap region. The Alliance motto is, "Well-designed, well-signed, well-maintained, well-promoted". We see success as people living actively, enjoying nature, and demonstrating a commitment to sustainability. The Shuswap Trail Alliance was recognized as the 2012 BC Parks Volunteer Organization of the Year, and is a recipient of the Queen's Diamond Jubilee Award. Check out Shuswap MLA Greg Kyllo's recent official statement to the Legislative Assembly of British Columbia acknowledging the collective work of Shuswap Trail Alliance partners here. The Shuswap Trail Alliance acknowledges the Milestone contributions ($10,000 or more) of Western Economic Diversification Canada, Services Canada, the National Trail Coalition Federal Trail Fund, the Province of British Columbia including Recreation Sites and Trails BC and BC Parks, the Southern Interior Development Initiative Trust, the Columbia Shuswap Regional District Areas C, D, E, & F, the City of Salmon Arm, the District of Sicamous, North Okanagan Regional District Area F, the City of Enderby, the Village of Chase, Shuswap Tourism, Salmon Arm Savings and Credit Union, the Rotary Club of Salmon Arm, Community Futures Shuswap, Thompson Rivers University, the Shuswap Community Foundation, BC Healthy Communities, Shuswap Lady Striders, Backcountry Horsemen of BC, Mountain Equipment Coop, BC Parks Community Legacy Fund, over 200 regional businesses including Skookum Cycle and Ski, Waterways Houseboats, Twin Anchors Houseboats, Lakeside Insurance, EZ Rock Radio, the Salmon Arm Observer, Stella-Jones, and Tim Hortons, and the 100s of individuals and volunteers from around the Shuswap who are helping to make our communities healthier places to live.